Carolina drivers claimed six victories in 12 class A mains over the weekend in USAC's Mopar .25 "Generation Next" event at Salisbury, N.C. The Eastern District Qualifier was presented by Tanner by Mittler Brothers. Representing North Carolina in victory lane at Salisbury were: Harrison Burton of Huntersville (Light 160 and Senior Animal), Nolan Allison of Greensboro (Senior Honda), Joshua Rummage of Lexington (Heavy Honda), Ryan Israel of Concord (Junior Animal) and Katlyn Stanley of Concord (Heavy World Formula). Jared Irvan of Wadmalaw Island, South Carolina was tops in Light World Formula. Ohio drivers Frankie Nervo (Stow), Tyler Shullick and Richie Streicher (Bluffton) also scored victories. Nervo took the Light AA honors and Streicher won the Heavy AA title. Shullick was tops in Heavy 160. Zeb Wise of Angola, Ind. won in Junior Honda and Ryan Krachun of Neshanic, N.J. won the Class B A-Main. Chandler Smith of Talking Rock, Ga. won the Heavy 160 title. 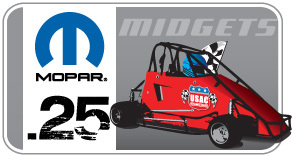 USAC's "Generation Next" tour now targets the May 29-April 1 "High Desert Classic" in Albuquerque, N.M. On Friday, April 29, the Roadrunner Club will offer tethered hot-air balloon rides for kids and parents from 6-8 pm in the track infield. $5 for kids, $8 for adults. Also, balloon trophies and checkered flags signed by the drivers in the race will be presented to all A Main winners at Albuquerque.